Special price if you buy all 4 Disks, normally £125 if bought separately. Monumental Inscription transcripts can help you find the burial place of your ancestors, these records are unique to the BMSGH and are not on any Family History website. 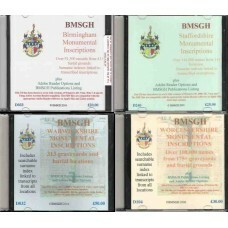 These CDs/DVDs contain a searchable surname index, linked to transcripts from all locations. Data on these CDs are in PDF format and are viewable on any PC using Adobe Acrobat Reader(supplied). Also readable on a MAC or Linux systems with the appropriate version of Adobe Acrobat Reader. 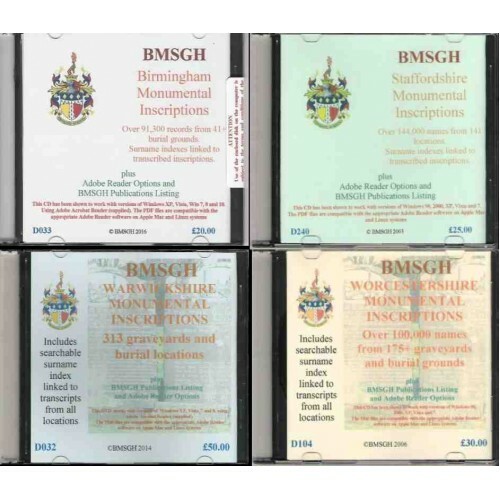 STAFFORDSHIRE MONUMENTAL INSCRIPTIONSOver 144,000 names from 141 locationsMonumental Inscription transcripts can help you find the burial place of you..
BIRMINGHAM MONUMENTAL INSCRIPTIONS41 graveyards and burial grounds(see below for list), 91,300+ recordsAlso available cheaper as a download, click her..
Special offer - 2 CD discounted price Monumental Inscription transcripts can help you find the burial place of your ancestors, these records are un..